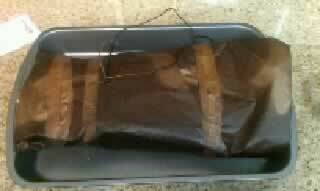 Wrapping a brisket in butcher paper will allow smoke to penetrate the meat while sealing in the juices. I first discovered there are several different types of butcher paper. Some types have a wax finish on one or both sides. Others are made from recycled paper and are pink in color. I chose the old-fashioned brown butcher paper with no wax on it. I found a large roll online and had it shipped to my house. I think it is three feet wide and about 1000 feet long. This should last a couple years... The important fact here is I read Franklin's uses the kind of paper without a wax finish, so that is what I used. For this trial I wanted to use a simple rub, so I coated the brisket with a nice layer of Kosher salt, black pepper, granulated garlic, and paprika. I pulled the brisket out of the refrigerator about 2 hours before I wanted to put it on the pit. I don't usually put a cold brisket on the pit unless I am in a hurry. Taking a brisket out of the refrigerator two to three hours before cooking is a good idea in my book! I wanted to smoke it low and slow so I heated the pit to 230 degrees F, and tried to maintain that temperature during the whole smoking process. I feel 229 degrees F is the magical temp, but what is one degree? I used a Choice brisket because I wanted a good cut of meat. 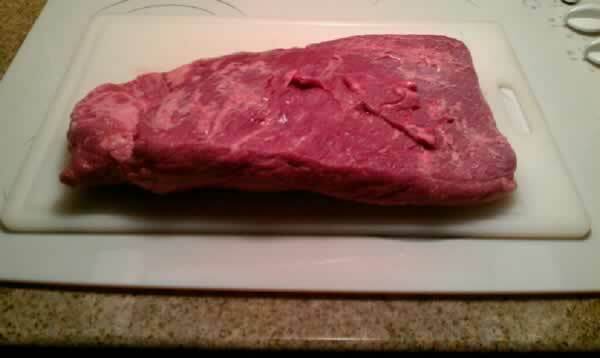 Your end product has a lot to do with what you begin with so always choose good cuts of meat. So, I smoked the brisket as I always do for right under 2/3 of the cooking process. I wanted a nice crust to form before I wrapped it in butcher paper. The internal temperature of the brisket was 165 degrees F before I wrapped it in butcher paper. 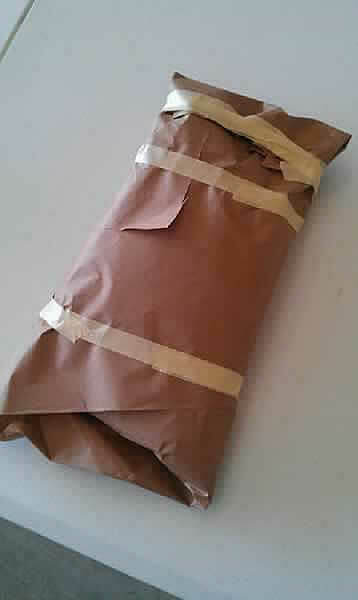 The trick to wrapping a brisket in butcher paper is to wrap it tightly, ensuring the brisket is incased with about 3 layers of paper.I used masking tape to seal the paper around the brisket when I felt it was wrapped correctly. I did not want any air between the paper and the brisket. After the brisket was wrapped tightly, I put it back on the pit fat side up and continued the cooking process. I wanted the internal temp to reach 185 degrees before it was done. At that point I took the brisket off of the pit and put it in a small ice chest for 3 hours. The brisket was still at 155 degrees after 3 hours of rest. When I unwrapped the brisket, I was as surprised as a 5 year old boy unwrapping his new train set on Christmas day. The brisket crust was beautiful! It was about 1/4 inch thick and there weren't and burnt spots on ithe brisket. The appearance was very consistent and cooked evenly throughout. When I sliced the brisket I was pleased to find an abundance of moisture. The meat was very tender and had a perfect smoke ring. The flavor was rich too. I am a firm believer in wrapping the brisket with butcher paper, and I will continue to use it during BBQ competitions and at home. 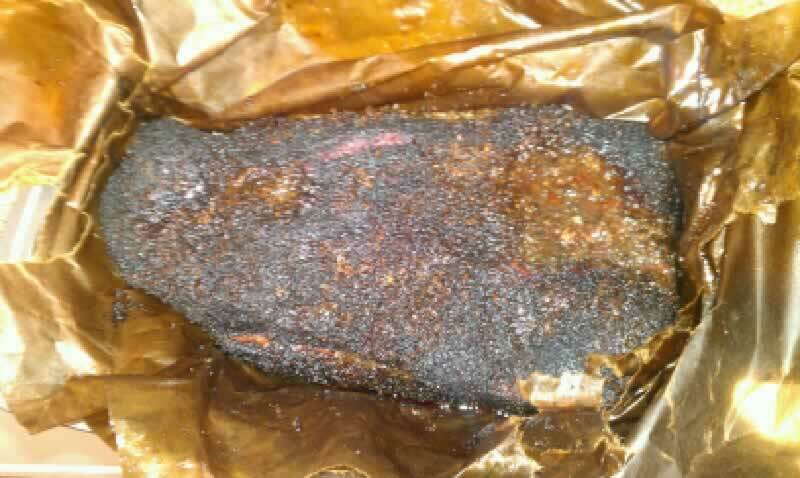 I have used foil to wrap briskets in the past, and I have cooked one mean brisket that way, but the meat may loose it's true "brisket" texture as it can be steamed by the foil. A brisket finished in foil will most certainly turn out tender, but it takes true skill to finish one in foil and get the true, non-wrapped look of a perfectly cooked brisket. I personally don't like steamed meat, and I would rather eat a slice of meat from a brisket that hasn't been wrapped in foil. Using butcher paper to wrap the brisket yields a much different result when compared to wrapping in foil or not wrapping at all. The brisket actually continues to absorb smoke because the paper is porous enough to absorb smoke and pass it on to the brisket. The butcher paper also retains moisture well and will not easily tear when saturated with juices from the brisket. The layers of paper soak up the rendered fat and juice from the brisket and continually baste it. I recommend trying this method to compare with other methods of smoking brisket!